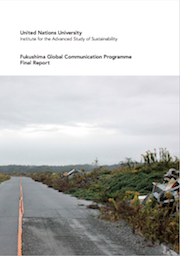 The Final Report of the Fukushima Global Communication Programme (FGC) has been published, presenting its research findings, policy recommendations and overall conclusions. FGC was a UNU-IAS research and dissemination initiative that examined the human and social impacts of Japan’s March 2011 earthquake, tsunami and nuclear disasters, and the challenges of the recovery process in Fukushima. The programme was implemented over a three-year period, from April 2013 to March 2016, and funded by the Nuclear Regulation Authority of Japan. Applying an interdisciplinary approach through research engaging leading international experts, the programme’s activities included field research, international conferences and workshops, expert consultations, public events and network building. The report summarizes FGC research in three key areas that are crucial for understanding and addressing the impacts of the 3.11 disasters: (i) disaster risk reduction and lessons from and for international policy, (ii) displacement and livelihoods, and (iii) risk communication and nuclear accidents. The analysis presented in the report highlights the complexity of the diverse and often deep-rooted socio-economic challenges that have emerged following the March 2011 disasters. These challenges are by no means unique to Fukushima or Japan. Indeed, the impacts of the nuclear accident and the policy responses implemented hold particularly important lessons for disaster risk reduction measures across the globe. The findings and recommendations presented in this report will be of value to policymakers in a wide range of countries, focusing on disaster recovery and risk reduction, as well as the social dimensions of compound disasters. A Japanese version of the report is also available.